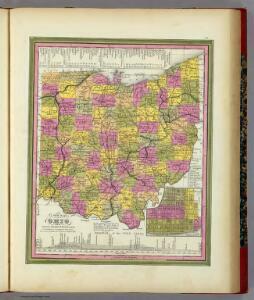 1 : 1300000 Mitchell, Samuel Augustus Jr.
1 : 1500000 Klippart, J. H.
1 : 1500000 Newberry, John S.
New rail road map of the State of Ohio. Climatological map of the State of Ohio. 1 : 1337000 Colton, G.W. 1 : 1440000 Tanner, Henry S.
1 : 3991680 Henshaw, Frances A.